Chelsea endured a frustrating first half against West Ham United on Sunday, with key man N’Golo Kante in particular struggling to have a positive impact on the game. 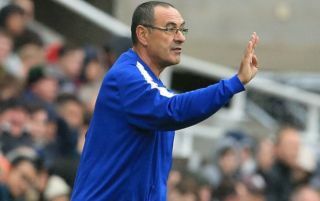 The Frenchman undoubtedly remains a fundamental part of Maurizio Sarri’s hopes of success moving forward, but given the way the game was playing out against the Hammers, the fans below on Twitter weren’t convinced he was being utilised in the right way. Given Sarri’s more expansive and possession-based style of play, the likes of Jorginho and Mateo Kovacic will undoubtedly flourish given their technical quality and ability on the ball. That isn’t quite the same for Kante, albeit his energy and defensive work remain crucial attributes to the team as a whole. As seen in the comments below though, some Chelsea fans weren’t convinced that Sarri was getting the best out of the World Cup winner at the Olympic Stadium, with one fan even suggesting that if the Italian tactician continues to deploy him in his current role, it could be enough to force him to consider an exit. As noted by Goal.com, the 27-year-old has been paired with a move to Paris Saint-Germain in recent months. Nevertheless, it seems like quite the stretch to go from playing in a side that has won every game so far this season as a key cog in the XI to wanting to leave Stamford Bridge. The more prominent issue is whether or not Sarri can continue to get the best out of Kante in midfield while deploying his usual tactics and system along with the style of play. If they can strike the right balance, it should be enough to convince fans like those below. If they can’t, then perhaps the questions will persist. Kante is not a attacking player!! Kante should be returned to his position,he’s just passenger here. But in this team, with the way we control possession, you just don’t need Jorginho & Kante ?